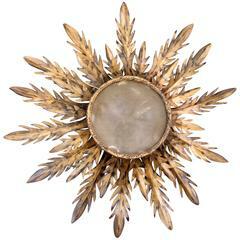 Gilt tole acanthus flush mount fixture for your ceiling or wall. This vintage Spanish light dates to about 1930-1960 (Barcelona) and is newly wired for use within the USA. Accommodates two candelabra-size bulbs. Ready to install. Newly wired for use within the USA. Accommodates two candelabra-size bulbs. Diameter measured from corner to corner. Two gilt-iron sconces, vintage from France, newly-wired for use within the USA (three lights each). 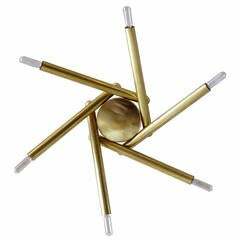 Stunning custom six-arm brass flush mount fixture, can be used as wall or ceiling light, available in different sizes and finishes, contact us for lead time. Elegant custom "Binova" wall or ceiling light designed by Gallery L7, with two opaline glass shades on a patinated raw brass disc, multiples and custom finishes available.